In this month’s edition of Smoke Fan Club we’re turning our attention to one very special kind of content. To celebrate World Book Day, the Smoke team and some of our contributors are sharing our favourite books. "When I first saw this book in an airport bookshop I was going off on assignment somewhere in the World, but what drew me initially to it was that the cover was from the photographic project titled “Children of Bombay" by my friend Dario Mitidieri. I picked it up and read the back comments and thought it would be interesting, I knew enough of the author and that he had written stories about Mumbai. I had been fascinated by the city after I had read Suketu Mehta’s Maximum City which was a meditation on the city and all its life. A Fine Balance is different; it's based during the time of the Emergency in the 1970’s and whilst Indira Gandhi is never named her presence as the Prime Minister casts a heavy shadow during a time when there was political unrest, human rights violations, detentions and forced sterilisation. The book intertwines different stories from its characters whether it's the Hindu tailors Ishvar and Omprakash to Mrs Dina Dalal, a Parsi widow trying to make ends meet and keep her independence. This masterpiece in my ineloquent words killed me emotionally in the best way, challenging my ideas of storytelling and as a photographer taught me there are so many paths to telling a story." "It’s one of the most compassionate and emotive books I’ve ever read. I recommend it regularly and reread often." "Mine is to Kill a Mocking Bird by Harper Lee. I read it age 12 and was excited to finally find a girl character I could identify with. Scout wasn’t a girl's girl which was like me and made me feel ok in my own skin/character. Someone who always wanted to do what the boys did, who could hold her own, was feisty, tenacious and ready to question things and speak out. So it was great finding a character like that at age 12. Also I’ve carried the below quote around forever. That’s definitely been my biggest life lesson. It’s when Atticus Finch told Scout that you have to walk around in people’s shoes to really get to know them. Plus To Kill A Mockingbird is the only book I have ever re-read." "If I'm honest, my favourite book is probably a tie between every P.G. Wodehouse book ever written, but if I had to pick one I'd go for "Leave It To Psmith". 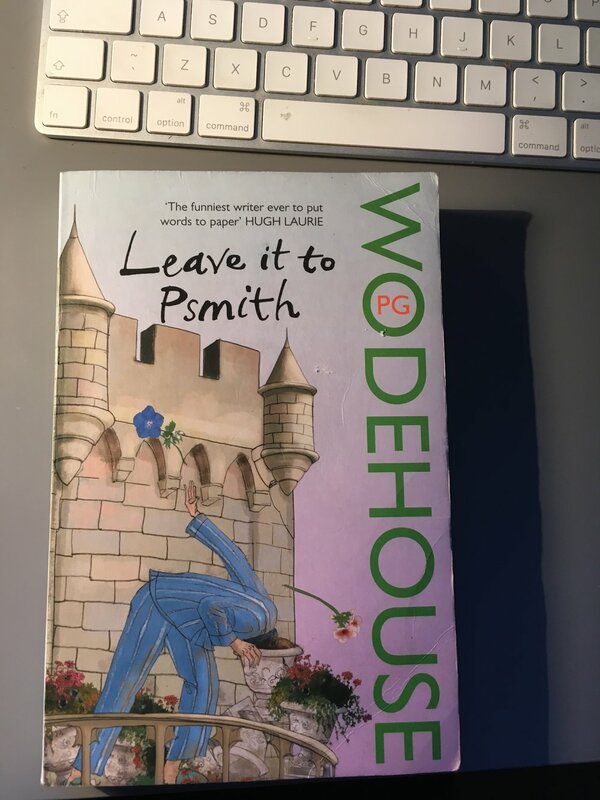 Psmith is one of Wodehouse's great unsung comic inventions: a thinking person's Bertie Wooster, if you will. Plus, it's got everything a great book should have: romance, humour, and an extended comic sequence with a pot plant." "I would struggle to choose a favourite book of any kind, and even a favourite professional title is hard, but at least it narrows down the field slightly. This one has always got to be in my top five professional titles: Grid Systems in Graphic Design, by Joseph Müller-Brockmann. It was first published in 1981 and is as useful and applicable now as it was the first day it was published. It was a book that opened my eyes and forever changed my working practice for the better. Required reading for graphic designers." "I've chosen In Search Of London by H.V. Morton, which is probably my favourite book about London. Morton travels round London a few years after the Second World War, revisiting sites of personal interest and historic importance but doing so against the ever-present shadow of the Blitz, the greatest calamity to afflict the capital since 1666." "Pat Reid was held in the Nazi regime's ‘escape-proof’ prison and made a successful home run to Britain so he was perfectly placed to write a gripping history of the many ingenious attempts to get beyond the castle’s high walls. I read the book several times in my mid-teens, which were not an especially happy time in my life. It not only provided me with some much needed (and quite literal) escapism but sparked a wider interest in prisoner-of-war escapes (I’ve scores of books on the subject on my shelves today) and history in general, for which I shall be forever grateful." "I was never a huge reader at school, so when our summer holiday homework was to read and review a book, part of the reason I picked this up was because it’s very short. When I finished it in a day, I wished there was more of it. It’s about Tom, a regular guy whose friendship group consists only of superheroes. He even marries one, The Perfectionist, but in a petty move The Perfectionist’s ex-boyfriend hypnotises her into believing Tom has disappeared. Tom then has to find a way to make himself visible to her again before it’s too late. It’s funny, it’s sweet, and you’ll be left wondering what your superpower might be." "The story of the British Antarctic expedition - an epic adventure where all men were returned safely. This happened as the 1st World War raged across Europe unbeknown to the explorers. I felt as if I had been on the expedition myself. Exhausting..."